An ideal lawn or a picture perfect lawn seems like a worthy goal in lawn care, but how do you achieve such a lofty goal? It all starts with obtaining the right information. Despite what television and newspaper ads proclaim, if you only use the right products, then anyone can achieve such spectacular results, it does take a little more effort. In truth, these advertisements are designed for one purpose only: to sell more product with the promise of a perfect lawn. That promise is something you have to work for, and achieve only by working smarter. What they don't tell you is that for a picture perfect lawn you need to go deeper and understand the true basic elements that go into an ideal green space. If you already have this ideal green space, then you're probably not reading this article. For whatever reason, these homeowner's already have the foundation for a great looking lawn. Commercials and advertising programs only give you one part of the picture. It's not that what they're saying isn't true, but it's not the entire story. If these lawn care products were the only missing elements to a healthy green lawn, then more people would own perfect lawns. Most homeowners are puzzled when their grass doesn't stay green and vibrant all season, or when it suddenly turns yellow or worse, deathly brown after applying expensive fertilizers. The problem lies deeper, down in the soil. 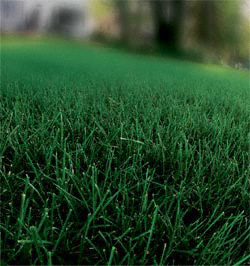 Fertilizer provides the nutrients that microbes convert into a solution that is easily absorbed by the turfgrass roots. The keys to this process are the MICROBES! You must have microbes to convert the fertilizer so it is usable. Without the microbes, then too much fertilizer never gets used and is wasted. Microbes like soils with lots of organic matter, soil that isn't compacted, and soil that doesn't get flooded very often. You don't really need to add additional microbes, they will come if you just roll out the welcome matt and give them some good healthy soil where they can set up shop. If you already have a healthy soil and you're still seeing brown spots, it could be that the soil simply needs a different kind of boost. Perhaps a pest is thriving in the soil such as white grubs or chinchbugs that eat away at the roots or the grass' root crown, both of which will cause the grass to wither and die. But you just can't go around spraying pesticides because you think there might be a dangerous bug. Every lawn has bugs and the big majority of these bugs are just fine and harmless. Spraying a pesticide because you think that brown spot was caused by a chinchbug, when it was actually caused by your neighbors dog doing what dogs do, is crazy. With just a little bit of research, you'll be able to uncover the cause of many problems, and with that knowledge, you'll be able to understand the best way to take care of it, which often means just ignore it and it will go away. Most lawn problems will do that (a few won't, but most will) and it is important, extremely important, not to go out and blindly start treating for problems until you know the cause of the problem. That's one of the main reasons for hiring a professional lawn care provider: they can give you a good assessment of any problems that you're experiencing and they can treat the problem the right way, the first time, without lots of trial and error. Every soil that contains organic matter has what experts call native fertility. The more richly organic a soil is, the greater is its built-in fertility. (We improve this when we add additional organic matter.) This is quite different from the kind of fertility that we get by adding fertilizer products. Native fertility is available for plants to use over a long period of years, even over a period of neglect. We should not rely on this native or fertility reserve for the regular nutrition of a lawn. This is particularly important with newer, more vigorous grass varieties. If we fertilize improperly or not at all, the grass will have to depend on the soil's natural fertility and will soon use it up.